Chuck Terpo began his piano-tuning career in 1977 in Birmingham, Alabama under the supervision of Mr. Calvin McCormack, head technician for Forbes Piano Company. After training under Mr. McCormack for approximately one year, Chuck relocated to the San Francisco Bay area in July 1978. He began tuning pianos for Sherman Clay & Company as a private contractor in August 1978, where he met Mr. Paul Kummer. Paul worked predominantly on Steinway pianos as a contractor for Sherman Clay (Paul is currently the technician for Stanford University, where he has worked for a number of years.) Paul mentored Chuck for several years while they worked together in Sherman Clay's warehouse. 1981: Recommended for and accepted to go to the Steinway factory in New York for the Introductory Technical Program (Joe Bisceglie, instructor). Upon returning to the Bay Area he spent most of the next ten years prepping Steinway pianos in the Sherman Clay warehouse. 1991: Accepted the position of Senior Steinway Technician at Sherman Clay in San Francisco. In September of 2002 he returned to the New York Steinway factory for the next level technical class taught by Mr. Eric Shendall. 1997: Traveled to Jakarta, Indonesia for the successful repair of a Steinway piano damaged in the process of shipping. 2003: Accepted to the Concert Tuning and Preparation class, taught by Mr. Eric Shendall at the Steinway factory. At that time he was the first Bay Area technician to be accepted into this prestigious class. Later that year, Chuck was appointed Senior Technician of the Sherman Clay Concerts and Events Services Department which supplies Steinway concert grand pianos for Steinway artists and various Northern California concert venues. From that time forward, he has performed concert tunings for some of the most renowned artists in the world. 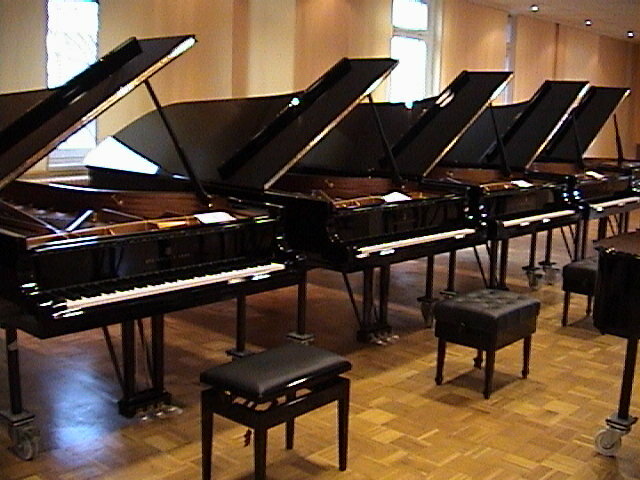 2007: Contracted by Yoshi's Jazz Club to travel to the Steinway factory in Hamburg, Germany for the selection of a new Steinway concert grand piano for their new club in San Francisco, where he continues to perform all tunings and maintenance on this beautiful instrument.